As another week of MMA comes to a close, let's take a look at what was hot and what was not so hot. Hot -- Bryan Pedersen: Many legislators have talked about the economic benefits of MMA when the sport is legalized. Few have gone the extra mile to find out what it feels like to be in a cage to fight. Pedersen will do that in Cheyenne, Wyo., this weekend. No matter the result, it's admirable that he has even gone the distance to train and join the first fights to take place in Wyoming's capitol. Not -- Renan Barao: The interim bantamweight men's champ was injured and had to pull out of his main event bout with Eddie Wineland at UFC 161. Dan Henderson and Rashad Evans' fight is now the main event, and Roy Nelson vs. Stipe Miocic was added. Hot -- John Cholish: After losing to Gleison Tibau at UFC on FX 8, Cholish decided to hang up his fighting gloves. Before he left, he decided to give his fight purse to Oklahoma tornado survivors. Not -- Brett Atchley: The manager who specializes in female fighters has been accused of bad behavior by several fighters separately. His alleged improprieties include accosting fighters, telling them he would "blackball them" from Invicta though president Shannon Knapp has denied anyone has the power to do this, and sharing the confidential details of a client's contract. His response? "It's really easy for women to play the victim, especially when they make their mind up that they're going to do it. Because everyone will believe them," Atchley said to MMA Junkie. Stereotyping women is not a smart thing to do, particularly by someone who makes his living off of them. Still taking temperature -- Cain Velasquez: He lost the UFC heavyweight championship belt once, and managed to get it back. 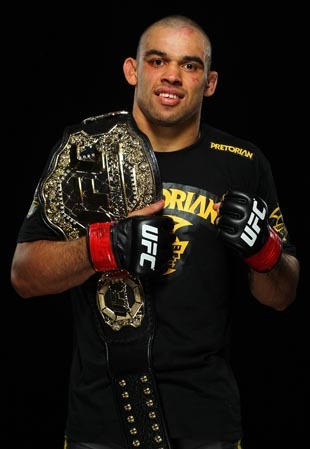 Will he defend it on Saturday night against Antonio Silva at UFC 160? Thanks for reading Cagewriter this week. Check us out on Twitter and Facebook for bonus UFC 160 coverage.